Nintendo’s live show delivered what fans wanted, but stretched hype nearly to a breaking point. ALL ZELDA. ALL THE TIME. In the past few years, Nintendo has always been the oddball when it came to its E3 plans, first abandoning a traditional press conference for a pre-taped ‘Digital Event’ that would make their announcements in between sketches and developer interviews, and then this year saw the big N eschewing even that format for a live show that bounced between trailers and interviews at their E3 booth. While the format was a mixed bag, the content was just meaty enough to sustain interest. 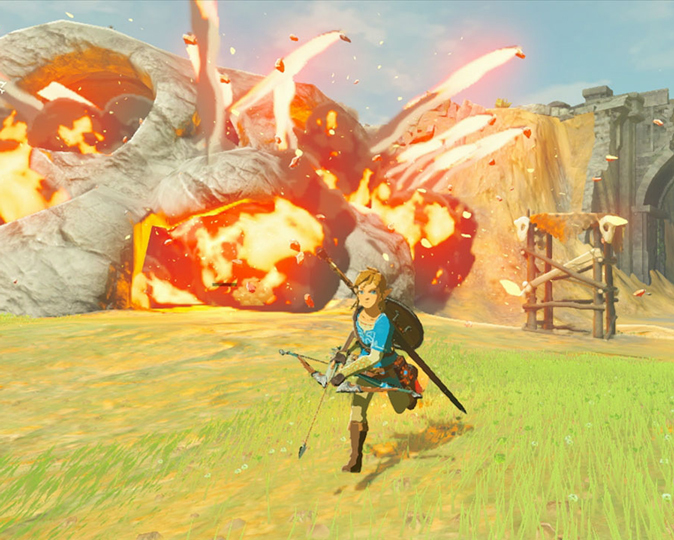 Nintendo of America CEO (and noted goofball) Reggie Fils-Aime started the show on a high note by jumping directly into the announcement trailer for the long-awaited new Zelda title, The Legend of Zelda: Breath of the Wild. Coverage then shifted over to Pokemon Sun & Moon, which showed a new trailer followed by a live demo with developer Game Freak present. The Pokemon demo was great to see, and having Game Freak there added some nice flavor to the proceedings; however, the segment was sluggish at times due to the interviewer’s insistence on pointing out things like lighting and camera angles, which while interesting to look at did not seem to demand a full explanation from the developers. The show then shifted over to Zelda, with American Nintendo Direct host Bill Trinen playing Breath of the Wild alongside Zelda series shepherd Eiji Aonuma. This one went much more smoothly than Pokemon, with Aonuma showing off the opening moments of the game and commenting on how the design decisions will inform this new take on the franchise. The rest of the event, which continued as a livestream, furthered this mix of demos and interviews, including new amiibo coming out in the coming months, as well as already announced games like the crossover Tokyo Mirage Sessions #FE. The stream also maintained a heavy focus on Zelda, which Nintendo oddly proclaimed would be the only Nintendo game playable on the show floor. Nintendo’s never been the easiest company to cover at E3, and their 2016 presentation was the weirdest beast yet. While it did deliver the goods (Pokemon! A full reveal of the new Zelda! ), the lack of a more traditional event was felt. Where was Nintendo’s Digital Events of yore, with tons of game announcements, the always enjoyably cheesy bits with Nintendo execs, the fun, snappy flow that set their pre-taped show apart from the more theatrical efforts by the other big companies? It’s clear that the Big N is a period of transition as the release of its new NX console marches forward, and the passing of Satoru Iwata still looms high as Nintendo looks to find a new direction for itself under new CEO Tatsumi Kimishima. Nintendo still makes some of the best games in the industry, that much is clear; it’s just hard not to wish that a company known for being so imaginative, so innovative, and above all, so fun, had come up with something more than what we got. Were the live demos enough or were you hoping for more from the Big N? Tweet me @MaxMielecki. And be sure to follow us @YouNerded.